NASHUA Votes to Stops Funding anti-Parental-Rights : NH School Boards Assoc. Everyone needs to contact their local school board members and ask them to do the same. Tell them to eliminate funding of “dues and membership” to the New Hampshire School Boards Association and the New Hampshire School Administrators Association. These two associations hire and pay six figure salaries to lobbyists that oppose local control of education. The school board association sends out weekly emails but never designates which way they are lobbying on any particular bill. Nor do they seek input from school boards on these bills. —The state prohibits the use of its funds from being directly or indirectly used to hire lobbyists under RSA 15. But schools pay dues to these organizations who then hire the lobbyists. Are they ignoring state law or just shuffling the money around? I. Except as provided in paragraph II, no recipient of a grant or appropriation of state funds may use the state funds to lobby or attempt to influence legislation, participate in political activity, or contribute funds to any entity engaged in these activities. II. Any recipient of a grant or appropriation of state funds that wishes to engage in any of the activities prohibited in paragraph I, or contribute funds to any entity engaged in these activities, shall segregate the state funds in such a manner that such funds are physically and financially separate from any non-state funds that may be used for any of these purposes. Mere bookkeeping separation of the state funds from other moneys shall not be sufficient. Source. 2006, 21:7, eff. June 2, 2006. When the school district allocates money for professional dues, this money is often pooled with membership dues from other districts and then used to hire a lobbyist. Who controls this lobbyist? Most taxpayers are unaware that their money may be indirectly use against them when they testify before their state legislature. Many times taxpayers are inadvertently funding their opposition without their knowledge. How can the people direct or control the voice of these lobbyists, which not only undermines their voice because a lobbyist can spend weeks in Concord in opposition to their bill, but it discourages individual citizen participation? *SB 320 relative to non-academic surveys administered by a public school to its students. For 2010 nearly all the NHSBA revenue $881k came from taxpayers through memberships $734k, policy subscriptions $72k, school district services $37k, school board development $16k, etc. The only revenue which isn’t directly from the tax payers is NHSBA’s investment income $18k. Yet NHSBA hides their policy objectives FROM THE PEOPLE!!! The NH School Administrators Association‘s lobbyist signed a letter in 2012 to support a Statewide Longitudinal Database federal grant application, which provides private student-level data to the federal government. How many taxpayers in New Hampshire, particularly parents, would have given their consent for this type of data-mining of their child’s private information? None. Yet using local taxpayer money, this lobbyist was hired with local taxpayer money and he supported a longitudinal data base that now tracks and stores some 400 data points of information on each and every New Hampshire student. Taxpayers and parents need to start demanding that their board members vote to STOP funding lobbyists who work against parental rights. If Nashua can do it, all schools in New Hampshire can do the same. This entry was posted in Parents and tagged Lobbyist, Nashua, NewHampshireSchoolAdministrators, NHSBA, SchoolBoard on March 2, 2016 by SCC. Kathy Dunton is one of the only school board members who’ve traveled to Concord to testify on behalf of parental rights and quality public education. 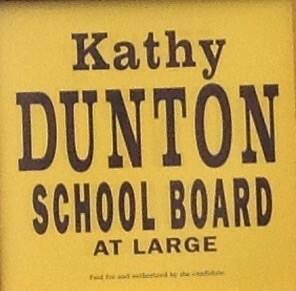 It’s important to get out and vote on Nov. 3rd for Kathy Dunton. She’s a strong supporter of parental rights and improving the standards and curriculum. 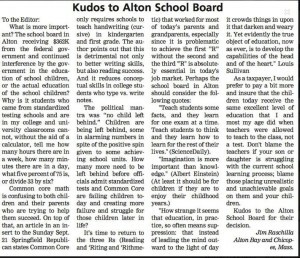 This entry was posted in Candidates, Political and tagged KathyDunton, Rochester, SchoolBoard on October 27, 2015 by SCC. MANCHESTER: VOTE FOR “GIRARD” SCHOOL BOARD, and other candidates. IMPORTANT election coming up on November 3rd. Richard Girard has done more to educate the public on the problems with Common Core and support parental rights. He is a leader in the community on this issue and is running for the “At-Large” seat. PLEASE visit his web site and VOTE for Girard. else who lives in Manchester. This entry was posted in Candidates, Political and tagged BenGamache, Candidates, ChristineDuffley, DebLangton, Girard, JoeLaChance, LarraineLencki, LisaFreeman, Manchester, MarkFlanders, RichGirard, RossTerrio, SchoolBoard on October 25, 2015 by SCC. URGENT VOTE on November 3rd. 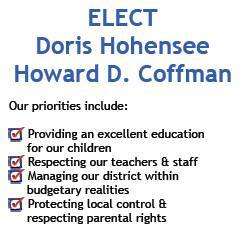 We believe these candidates are the best ones to support parental rights and quality academic standards in Nashua. Stop Common Core in NH is committed to parental rights and opposing unproven federal initiatives in our schools and will continue to guide voters towards the best candidates running for school board. 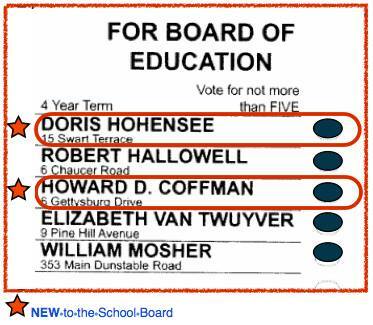 This entry was posted in Miscellaneous and tagged Candidates, DorisHohensee, HowardCoffman, Nashua, SchoolBoard on October 25, 2015 by SCC. We’ve received NUMEROUS complaints about former Board of Ed member Christopher Stewart when he opposed parents in Manchester who vocalized their opposition to the Common Core Standards. Parents throughout the city attended school board hearings demanding better academics for their children. It was the best example of democracy in action for the children, one could hope for. How did Christopher Stewart respond? By voting against the parents and maintaining the dumbed down Common Core standards for his school district. Now Stewart has moved on to another Obama initiative, early childhood education. In other words, Obama wants the taxpayers to fund universal pre-school for all!! Stewart seems to be Obama’s man to get that done in New Hampshire. Recently Stewart, along with his colleague Meryl Levin who are co-chairs of the Don’t Wait. Educate wrote an article in the Manchester Union Leader calling upon local candidates to sign a pledge supporting this tax initiative. They refer to studies by saying, “Studies show kids without access to quality early learning programs fall further and further behind as they move through school. They have an increased probability of behavioral issues in class. They are more likely to live in poverty or commit crimes in adulthood.” – See more at: http://www.unionleader.com/apps/pbcs.dll/article?AID=/20151008/OPINION02/151009183#sthash.BRAHtqH6.dpuf However they provide no studies to back up their claims. What did Stewart do when parents in Manchester came to him and asked that the Board vote to develop higher and better quality standards? He voted against them. How can anyone take him seriously now? Why is he focusing attention on early education when there is sufficient data that shows early childhood education isn’t effective? The United States Department of Education called for independent studies on early childhood education. In both of these studies, early childhood education was not effective on student outcomes. Stewart failed to share this information in his article. Now his organization is targeting candidates who are not foolish enough to jump on his tax and spend bandwagon knowing that with limited resources available, maybe it’s better to invest in fixing our k-12 public schools in Manchester. The district he didn’t support as an elected member of the board. Who really supports public education? The board member trying to tax you so you pay for a program that has no proven success ? Or the good people who wanted to uplift all children, k-12, in the Manchester school district? We want to make it clear that we do NOT oppose pre-school for children. In fact, if this is something that a parent feels is good for their child, we stand behind those parents. However there are many children who do not need to be forced into a pre-school program because Obama and Stewart think a comprehensive approach to pre-school is necessary for all children. Let parents decide what’s good for their kids. If Stewart wants to help the children in attend pre-school, why not look to fundraising efforts? Why try to force candidates to support a comprehensive tax and spend policy that has NO track record of actual success? Obama wants universal pre-school because that is part of the Common Core agenda. Children are now considered human capital for the workforce and getting them into early childhood education is a must. It’s in their literature. Don’t be fooled by another big government, tax and spender like Stewart. His track record on the Board of School Committee speaks for itself. If he really cared about the quality of education our children deserve, he would have voted in support of the parents. This entry was posted in Candidates, Political and tagged ChristopherStewart, Manchester, Pre-K, PreSchool, SchoolBoard on October 22, 2015 by SCC. It seems as if Governor Hassan will not have town-hall meetings where parents can discuss their concerns with Common Core. Now her Commissioner of Education, Virginia Barry refuses toVirginia Barry (Refuses to Visit) letter to Manchester School Board 4-8-15 meet with our elected board members in a public meeting. We want PUBLIC meetings on Common Core. We want our Governor and her appointed Commissioner to attend public meetings where we can voice our opinions. Why are they hiding from parents and now our elected board members? 1) Ask her to sign SB101 which was passed by the NH House and Senate. 3) Ask her to direct Commissioner Barry to meet with our local school board members publicly so parents can attend. Closed door/private meetings with our Superintendents or board members do not offer parents information that they should hear. Common Core is being thrust on our schools and no one in the Hassan Administration wants to hear from parents. This is unacceptable. This entry was posted in Inappropriate Lessons, Political and tagged CommissionerBarry, GovernorHassan, Manchester, SchoolBoard on April 15, 2015 by SCC. Tell the MANCHESTER School Board to STICK WITH THE PLAN and to NOT administer the Smarter Balanced Assessment!! Show up and be heard. Bring the Smarter Balance Assessment opt out form and leave it for the full board. One night is all we are asking. Bring the kids if you don’t have a sitter. It is a great civics lesson for them. This entry was posted in Miscellaneous and tagged Manchester, SchoolBoard, SmarterBalancedAsssessment on January 30, 2015 by Admin. 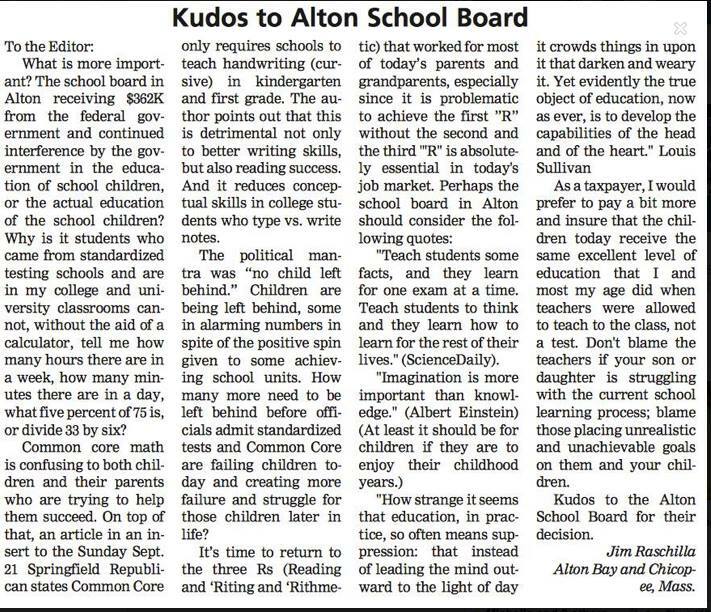 This entry was posted in Funding and tagged Alton, Commoncore, federalfunding, SchoolBoard on October 16, 2014 by Admin.